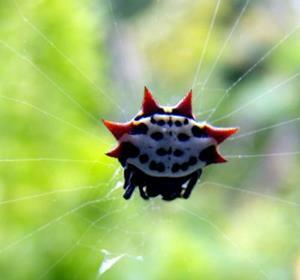 These are star spiders. They are in abundance in my back yard in Florida, all sizes from tiny to full grown, which is about the size of your little finger nail. They are quite colorful with a hard shell which makes them not look so much like a spider, until you accidently walk through their web and find one dangling from your hair.